Betty Marie McMillan (nee Ashbourne), 95, passed away peacefully at Spruce Lodge on February 16, 2019. Born in Toronto, daughter of the late Ernest and Beatrice (nee Weston) Ashbourne. Beloved wife of the late Eric C McMillan who predeceased her November 26, 2016. Loving mother of Eric G McMillan (Wendy), Suzanne Kelly (Chris), Beatrice McMillan and Judi Gilbert (John). Grandmother of Erin McMillan (Chris), Owen McMillan (Lan), Richard McMillan, Baird Kelly, Liam Kelly, Sydney Buhrow, Jaymeson Denboer, Matheson Denboer, James Gilbert, Alyse Gilbert (Tom), Michelle Thompson (Chad) and Jules Gilbert. Dear sister of Richard Ashbourne (Mabel), Paul Ashbourne, and sister-in-law of Winnie Ashbourne. Lovingly remembered by several nieces, nephews and great grandchildren. Predeceased by brothers Lloyd and George Ashbourne (Nina), sister Grace Maxwell, granddaughter Suzanne McIlroy (Sean), and nephew Randy Ashbourne. Betty grew up in Toronto attending North Toronto Collegiate. She loved swimming, particularly with the Toronto “Dolphinettes” Synchronized Swim Team. As President of her sorority, “Tri Delta,” Betty first met Eric at a Tea Dance she organized at the University of Toronto. They married and moved to Stratford where they raised their four children. Betty taught English as a Second Language, French, Spanish and Physical Education in Stratford and Mitchell and was a realtor with brother, Richard, at Ashbourne Realty. Community involvement included, running Central United Church (Currently Avondale United) Sunday School programs, serving as president of the United Church Women, training for Canada Census, Welcome Wagon and as a member of Kiwins. A keen interest in politics led her to become Campaign manager for Hugh Edighoffer and Bill Somerville. 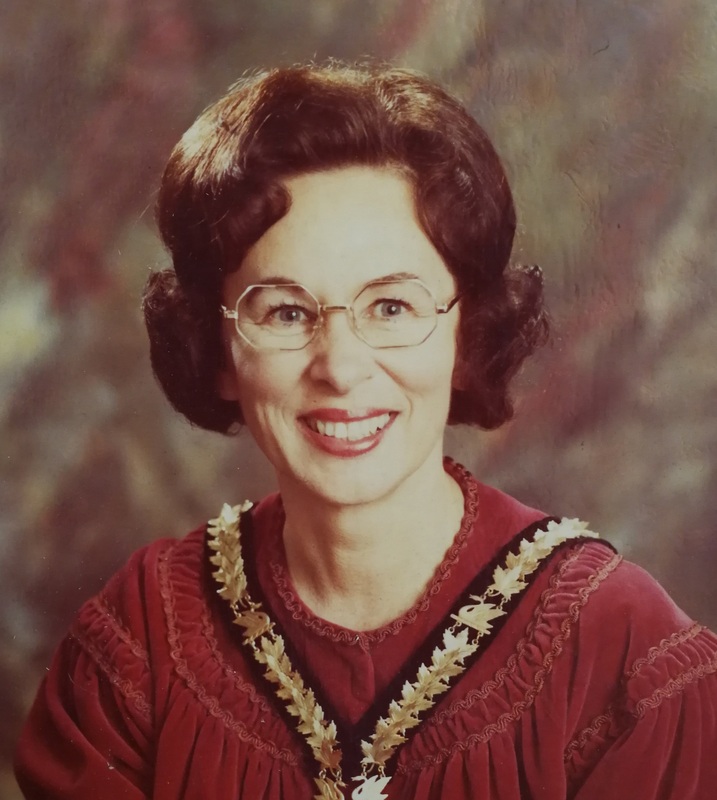 She served one term on the Board of Education, many terms as Alderman and eventually became Stratford’s first female Mayor in the 1970’s. Eric jokingly referred to himself at that time as “Mr Betty”. Betty and Eric spent many happy summers cottaging at Kettle Point and enjoying winters in Panama City Beach, Florida, with their large circle of friends. Betty, an accomplished painter, won a number of ribbons and continued painting into her final days. Her room at Spruce Lodge was adorned with her colourful art. Betty was a golfer and in her later years became an avid fan. Betty’s family is very appreciative of the staff at Spruce Lodge and their loving, attentive care. Betty was particularly fond of Dr Thompson in her final years at SL and in earlier years of Dr Leaney, who always had time for her and a discussion about the issues of the day.